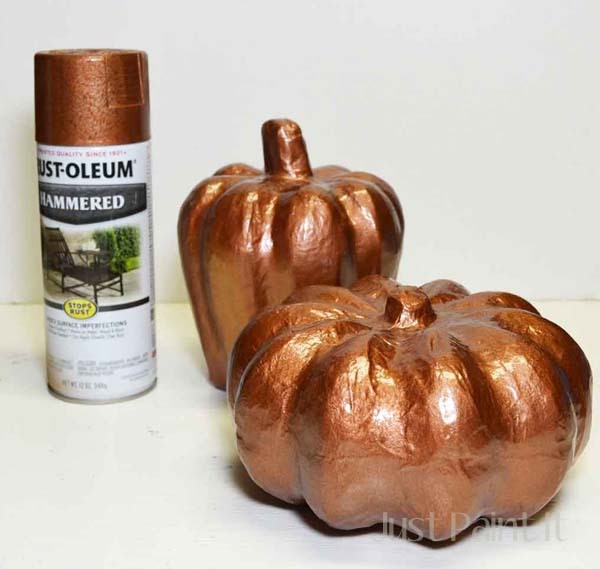 I don’t know what it is about shiny copper pumpkins this year. 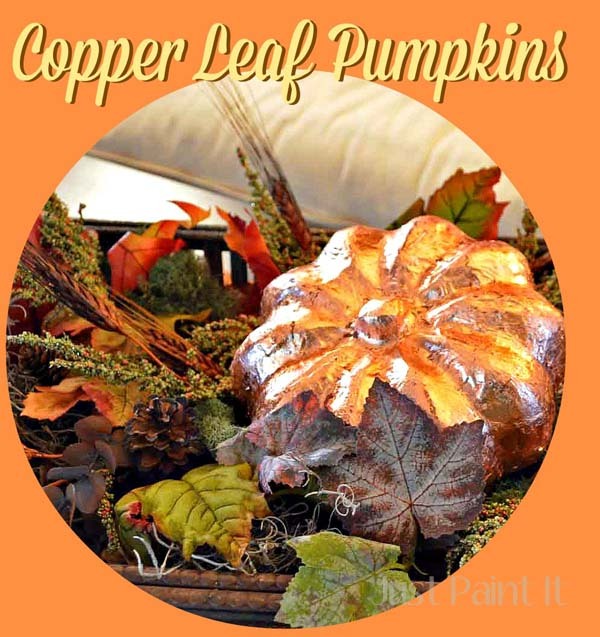 First the glittered copper pumpkin and now copper leaf. 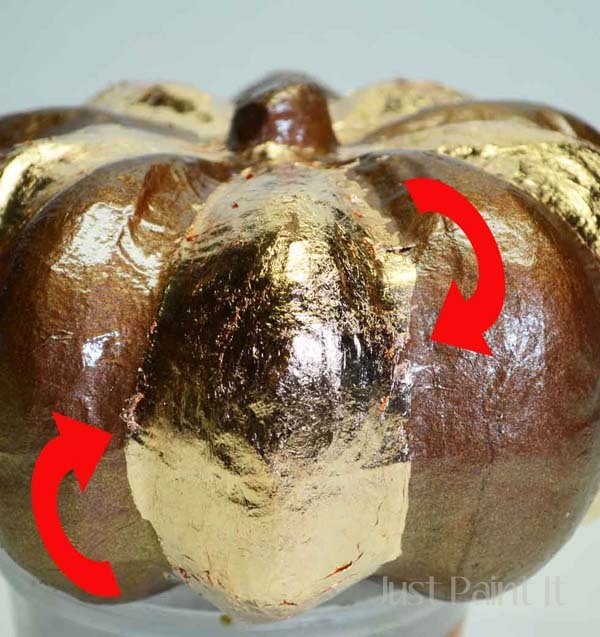 In my own defense, the copper leaf was stored in the same box as the glitter and originally I thought I could combine the two on one pumpkin. Granted, I’m still having issues – lots and lots of issues – with my mental capacity. I don’t know what happens when you’re grieving but basic mental operations elude me. I’m forgetful, more than usual. Things are hard to figure out . . . more than usual. And on and on. One of my aerobic students told me she had been more forgetful than usual. She lost her dad a few months ago. She asked me if this was “normal”, as if there is such a thing as “normal” when you’re grieving. Since I’m the resident Grieving Gal, I told her that, yes, I believe it is common. And yes, I went back to teaching aerobics this week, primarily in hopes of getting some mental action back. When you teach aerobics, it’s a lot like spinning plates – you have to do the moves, know what moves come next, make sure all the students are keeping up, and so on and so on. If one plate stops spinning – or worse, drops! – chaos ensues. On a good day it’s hard to get the class back into the groove. But when you’re battling all of this mental funk and confusion, it’s even more challenging. The point being, teaching or even just participating in aerobics or dance is great for the brain muscle. Or so ‘they’ say. It’s even supposed to ward off Alzheimer’s. It was probably too soon for me to go back to class after Mom’s passing October 7. I could’ve used another month, I think. But I also wanted to at least try to get some intellectual sharpness back. 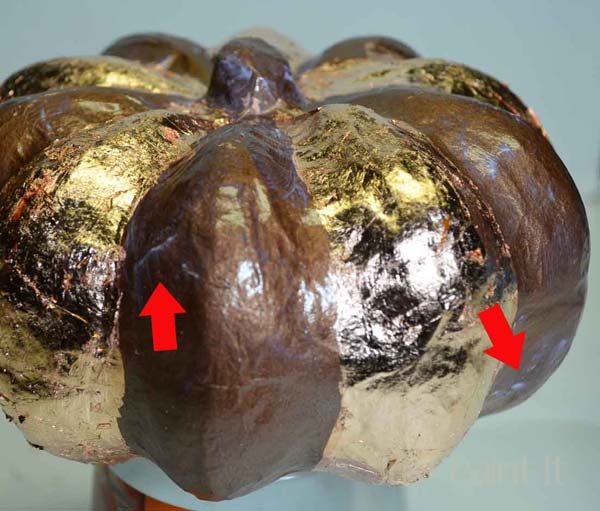 What that has to do with shiny copper pumpkins, I have no idea. So there you are. 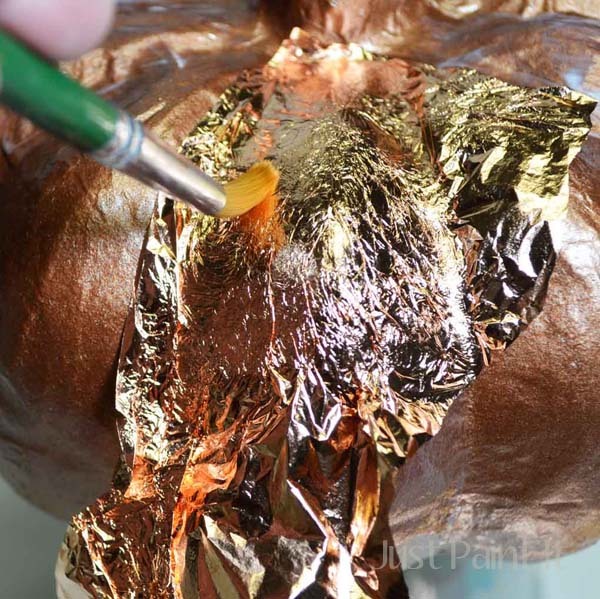 I started the leafed pumpkin the same way as the glittered pumpkin – spraying with bright gold and then a few shots of copper here and there. I wanted the metallic to have more dimension which is why I added the gold and the copper in layers. Probably hard to tell in this photo the layers of metallic. You can see a little more of the gold in the pumpkin in the background. But you know what, when all is said and done, it doesn’t matter one bit. Not at all. sheesh. I just realized that. 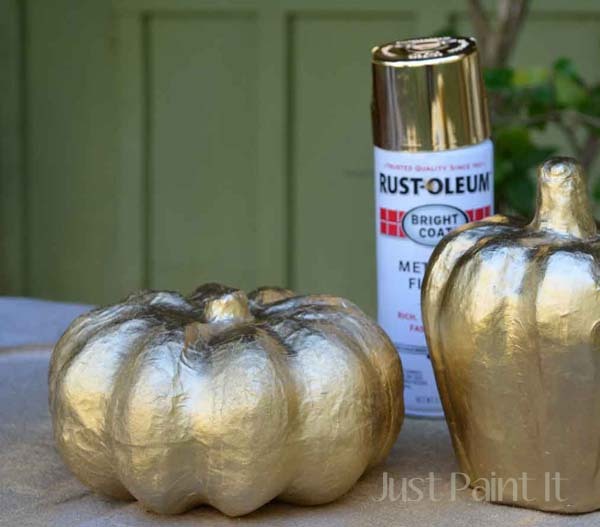 You’re going to be covering the entire pumpkin in copper leaf so whether or not there is a little gold or not is totally irrelevant. I’m glad I’m not working on some ‘serious’ house projects right now or I might be in real trouble! I don’t remember having these mental gaps when my husband died but I think I basically slept for the first few months after he passed. 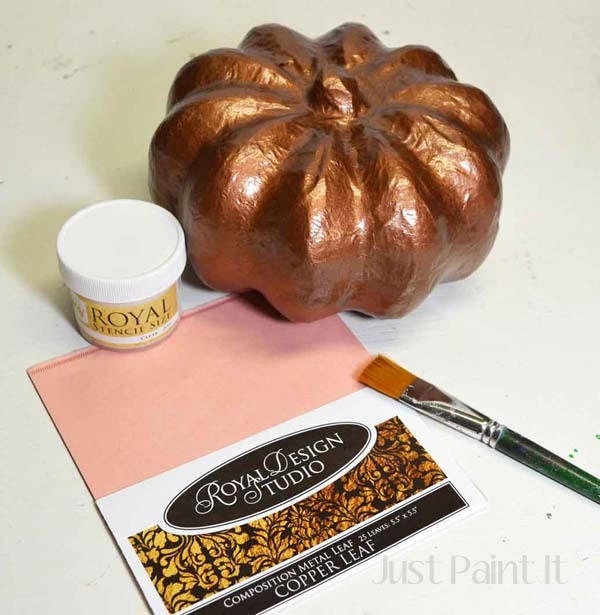 I already had the Royal Design Studio Copper Leaf and Stencil Size from when I stenciled my brother’s table. I’ve been wanting to try my hand at leafing again because there is a little learning curve when it comes to using the size. Not ‘learning’ so much as knowing how thick to apply it and how long to let it set up. For instance, this was my first coat of size. If you’ve done any sizing at all you know that this is waaaay too thick and heavy. But not me. Oh no. 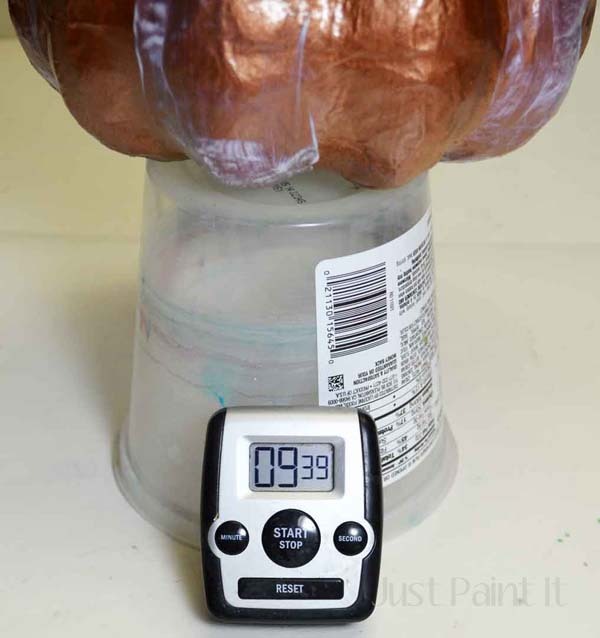 I set my little timer for 10 minutes thinking that thick goopy layer would be ready for a thin frail piece of copper leaf. As time ticked by I saw the error of my ways. 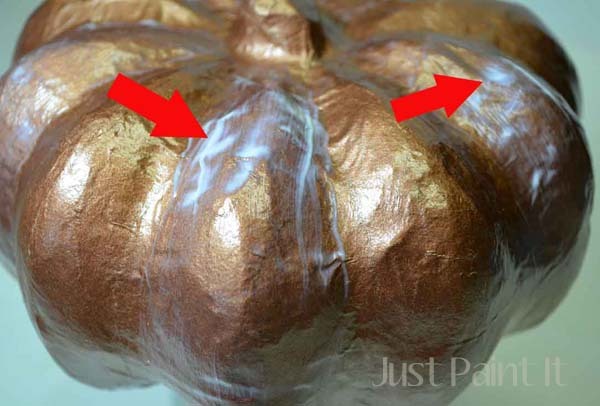 Now, leafing a little pumpkin like this? No big deal. But if you were trying to stencil with size and had a thick layer like that? Huh uh. Not good at all. Thin layers and let them set up – meaning tacky to the touch, not “wet”. I went ahead anyway and gently pushed the leaf sheets onto the sized areas. See all of those wrinkles? That’s because the size was too thick and wet. I mean, it doesn’t really matter on a pumpkin. 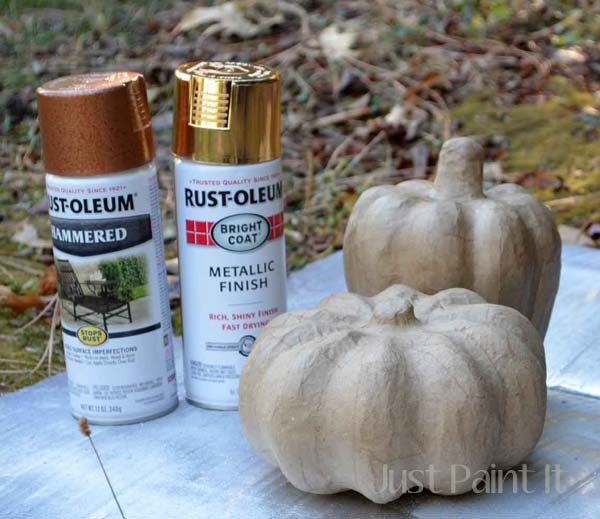 So maybe copper leafing a pumpkin is a good idea after all because when you want to stencil a table or dresser or whatever, you’ll feel much more comfortable with the stencil size and copper or gold leaf. Plan A was to alternate sections of copper leaf and copper paint. ahem. On to Plan B seeings how there was no way I was going to get a nice smooth line between the two sections. But, hey, Plan B also gave me another opportunity to apply the stencil size . . . . lightly . . . with only a few ridges of white build up. Mucho better. You’ll want to save all those teeny tiny pieces because you’re gonna have teeny tiny spaces that need those teeny tiny pieces. Did I mention that a requirement for copper leafing is patience? Yes, lots of it. However, on the up side, since the basecoat is copper, if you miss a spot here and there, it’s not really noticeable. So there’s that. Okay! Not so bad . 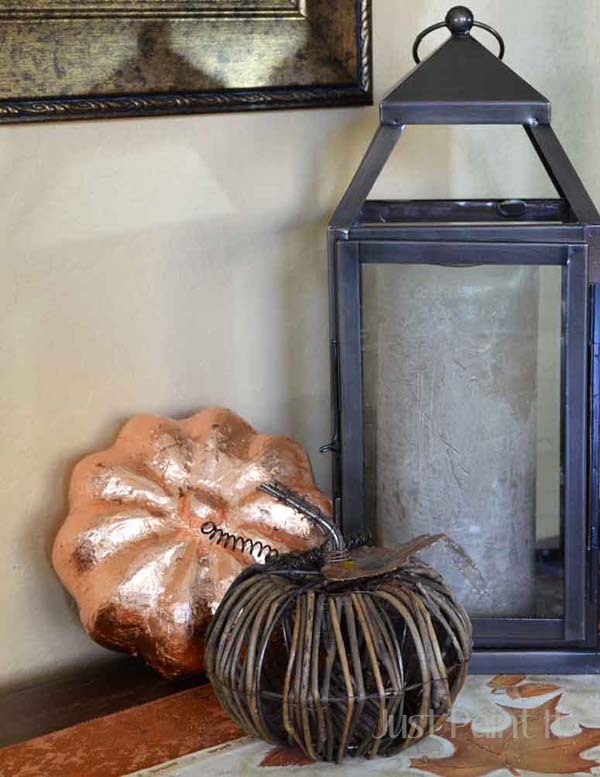 . . except where to put a copper leafed pumpkin? Not so good right next to the glittered copper pumpkin. Instead I went right around the corner into . . . well, I don’t have a name for this room yet. Mom called it her ‘meditation room’. Nah. Not that I don’t meditate, I do. But not in that room. It’s right off the entry too so it’s kind of like a hallway. I think I’ll dub it the ‘sitting room’ for the time being. 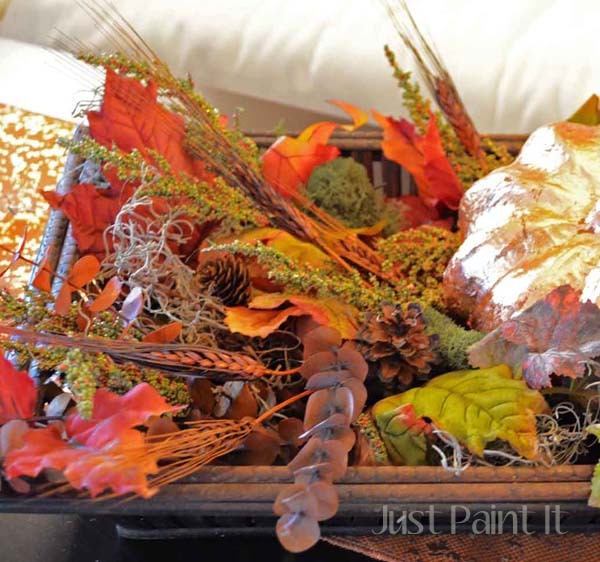 At any rate, I grabbed some different textures – the shiny pumpkin, fall leaves, eucalyptus, dyed wheat, spanish moss, and a basket-tray-thingie. Then you just start putting stuff down, moving it around, picking it up, putting something else down. The orange ‘runner’ came on a roll at Walmart last year. I didn’t see it this year though or I would’ve picked up another roll or three. I cut it into about 4 pieces and it works great . 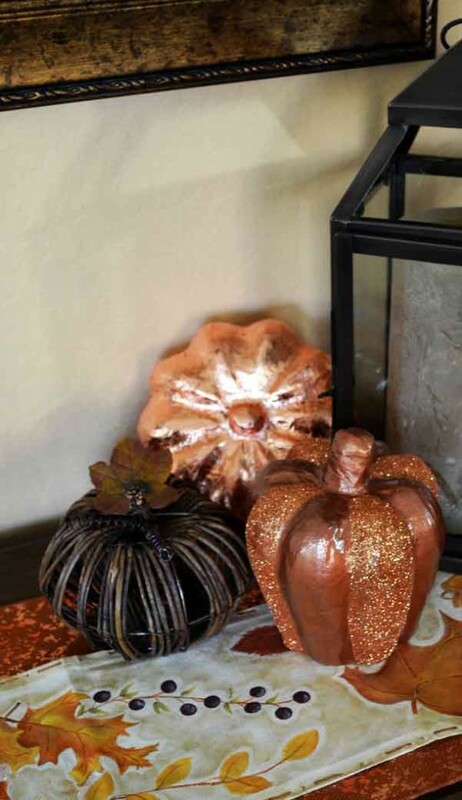 . . especially if you have shiny or glittered pumpkins. 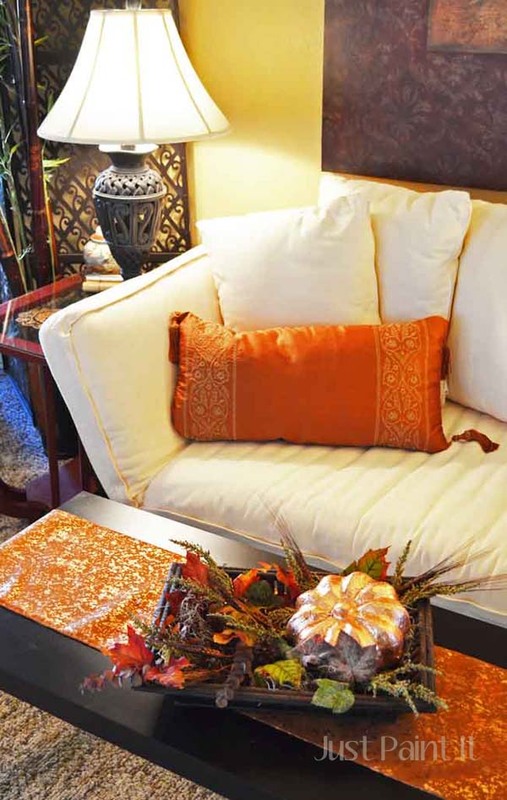 Then you just layer in different textures and colors. Kind of looks like mish-mash here but, really, it works. 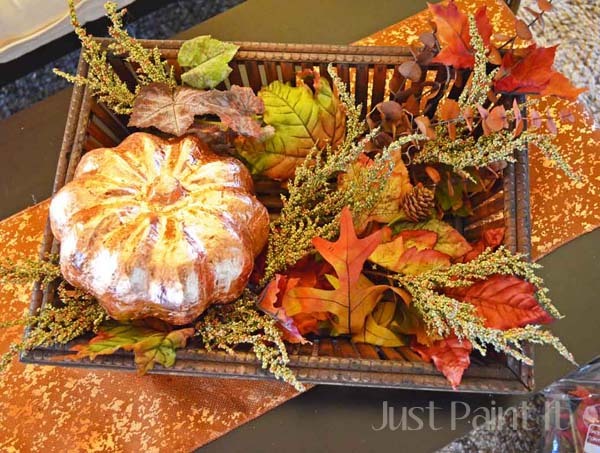 The dyed wheat added just the right touch. The tiny green berry stems are actually Christmas decorations and have a slight shininess, which works back to the copper leafed pumpkin perfectly. 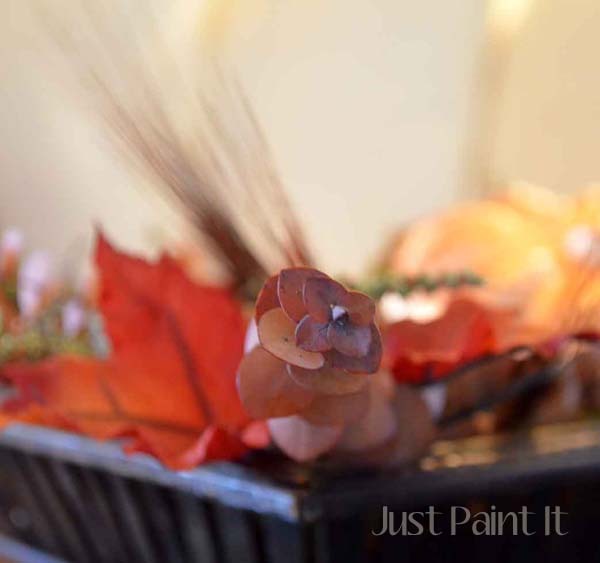 I used some silk leaves, and some preserved oak leaves. All the different colors and tones were perfect. The spanish moss makes wonderful filler. 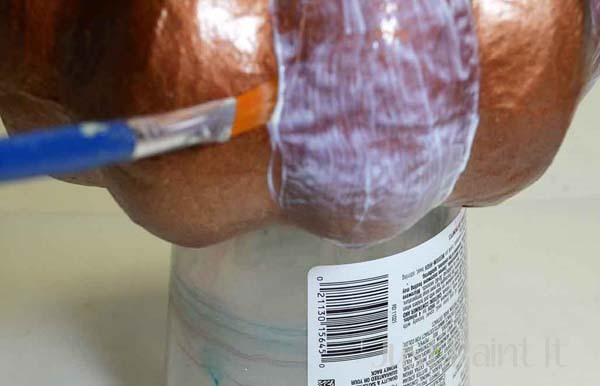 It’s light, not dense, and has good movement if you don’t stick it in heavy clumps. And, of course, I adore eucalyptus because it’s a ‘line’ botanical but also has cylindrical shapes, something that’s not always easy to find in line flowers. 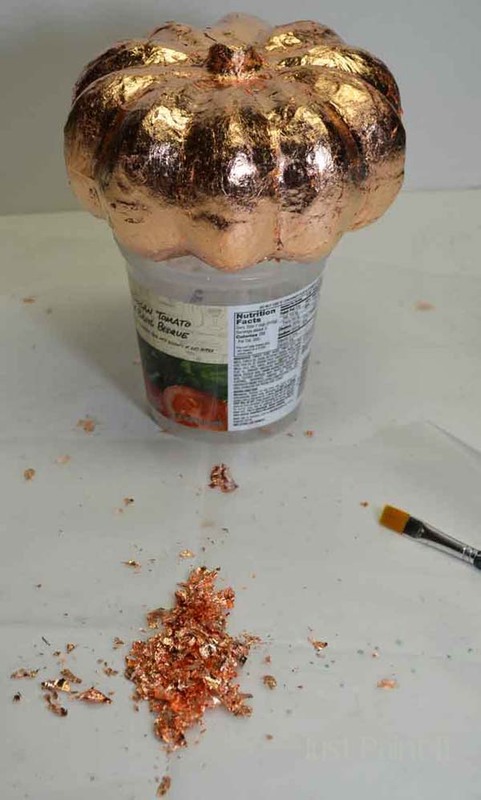 So my crazy idea of a shiny copper leafed pumpkin wasn’t as crazy as I thought. 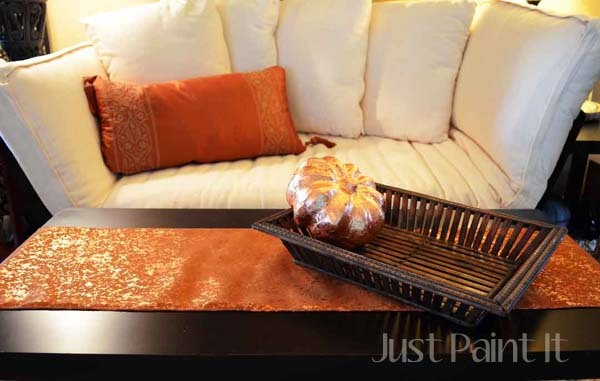 It works back to my brother’s stenciled copper leaf table next to the settee. 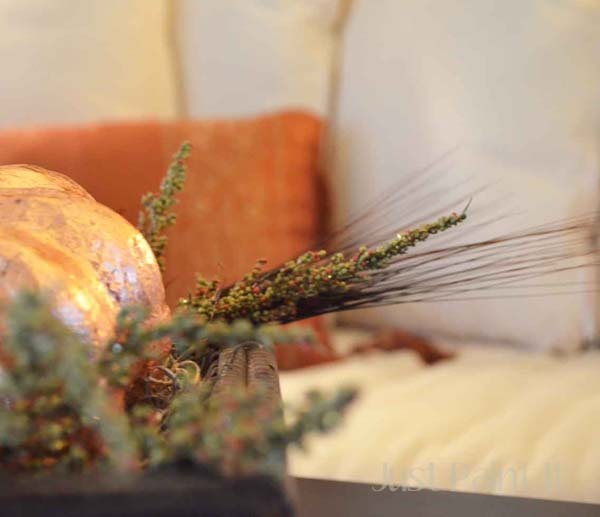 The lumbar pillow is a satin deep russet which pulls the richer tones in the basket. 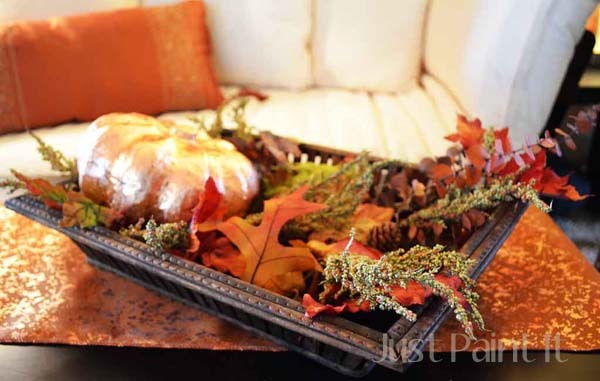 And I really like putting a design in a basket, making it portable if you have guests . . . which I won’t be doing any time soon. Ok, except maybe a visit from my grandson. All the more reason to be able to move the basket. Maybe my mushy mourning mental state isn’t as bad as I thought it was. Or maybe I just got lucky. Either way, I’m happy with it. And if I change my mind, I can always just pick up the basket and move it somewhere else . 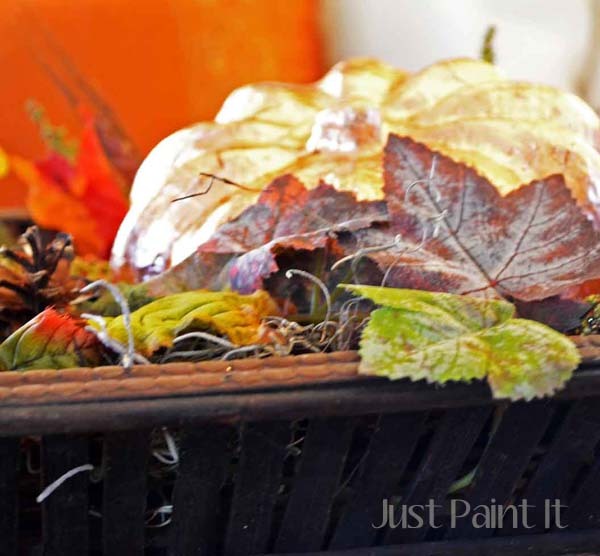 . . like the front porch, which still needs to be decorated. Or maybe not. We’ll just have to see if it gets done or not. I’m trying to be really kind to myself right now – something very foreign to me. I generally beat myself up if everything on my list doesn’t get done. But not now. For now, I’m trying to take time to enjoy every blessing I have – whether it be a nap or three, or a shiny pumpkin or two. It all looks beautiful! AND I learned some very good hints about how to use the big bag of copper leaf that has languished in a drawer for so long!!! If you didn’t have brain fade after all your stress I’d be very concerned. Just keep being kind to yourself. You deserve it!